First, let’s talk about the parts here. You should already know what Amazon Web Services is, what a Virtual Private Cloud is, and have an account at Amazon to use them. You should know a bit about what Juju is as well, but as this is a first timer guide, here’s all you really need to know to get started. Juju is an amazing tool for modeling complex workload deployments. It takes all the difficult bits of deploying any workload that has a “Charm” in minutes. All the brain-share needed to install and configure these workloads is encapsulated in the “Charm”. To configure, you can pass YAML files with full deployment configuration options, use Juju commands to set individual configuration options, or pass them via the juju gui. Juju is very extensively documented at https://jujucharms.com, and I highly recommend you RTFM a bit to learn what Juju can do. 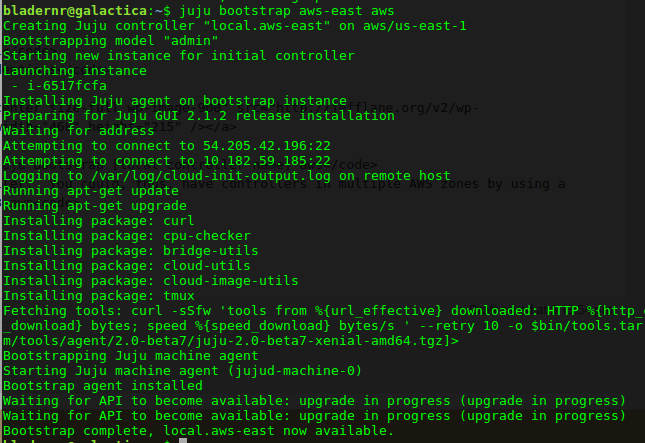 This will trigger juju to spin up two new instances in AWS, one running WordPress and one running MySQL. Adding the relation causes WordPress to use the MySQL instance as it’s database backend. and wordpress is ready to configure! So there you have it. When I started this article, I mentioned it had been a while since the last time I used Juju with AWS. In the “old days” configuring this meant a lot of manual editing of a YAML file to set up the region and credentials and other things necessary. Juju 2.0 streamlines this entire process so that if you have your keys configured as ENV Vars, you could go from zero to fully deployed in minutes.